Durham, N.C. (June 28, 2018) As a dive professional you do everything you can to protect your divers; now it's time to ensure you're protected, too. If you're like many of your industry colleagues, your liability insurance policy may be expiring in just a few days. That's why DAN is taking a moment to remind you to ensure you remain covered. "DAN has built a reputation people can trust and have confidence in, and they'll never have to worry about whether DAN will be there when they need us." "Why did DAN get into the liability business? To make a difference, reduce the number of incidents and minimize your risk." "Any profits that come from the program are going to be reinvested into the diving industry." "DAN is reaching out to the industry to create a culture of dive safety." Before you make your liability selection, take a look at what DAN has to offer. You will find the rates to be highly competitive and the policy and coverages similar to what you are used to (Prior Acts coverage, Refusal to Train coverage, and no reduced ratios for introductory scuba). Where you will see a difference is in the level of support that comes with your liability program. After all, protecting divers is what DAN has done for nearly 40 years. To learn more, visit DAN.org/liability, call us at +1 (919) 490-2934 or email us at LiabilityInsurance@DAN.org. About DAN: The world's most recognized and respected dive safety organization, Divers Alert Network (DAN) has remained committed to the safety and well-being of divers for nearly 40 years. DAN's research, medical services and global response initiatives make up an extensive network capable of supporting divers with vital services including injury prevention, safety and educational programs and lifesaving evacuations. 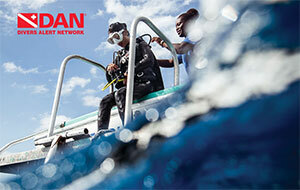 Every day, hundreds of thousands of divers around the world look to DAN as their dive safety organization. Join the DAN community or learn more at DAN.org.